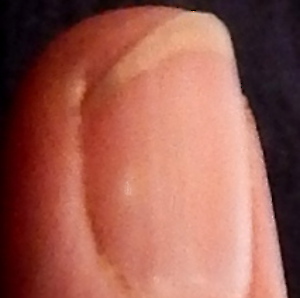 I have experienced stress that causing white spots on my fingernails. I have seen a line of white spots appear on my middle fingernail where there were no white spots an hour earlier. What kind of stress does that? Indeed, when you succeed in the face of obstacles, you get a real, perceptible boost to your sense of well being. You feel stronger because you applied your strength and it paid off. You feel good because you took care of yourself and now have added confidence that you will be able to take care of yourself in the future. But when you are in a situation over which you have no control, where the outcome is out of your hands — no matter what you do, you will suffer, there is no way you can protect yourself or alter what is being done to you — you are helpless and can feel your well being, health and confidence taking a hit. The later kind of stress is the kind that hurts your nerves. It can come from abuse by a family member or someone you thought loved you. It can come from being unfairly targeted by police. It can result from being denied your basic rights by a judge who is accountable to no one. The kind of stress that damages your nerves comes from being on the losing end of a conflict with something more powerful than you that has control over you or an aspect of your life. At its worst, stress is bound up with a loss of confidence in yourself. This occurs when you trust the thing or person who is hurting you. You believe at the deep level at which your trust exists, that the thing or person who is hurting you, is good. To continue with your trust requires self destruction. Equally, to sever yourself from the trust is self-destructive because the trust is a part of you. Good and Trust are intrinsically bound together when you place trust. It is extremely painful to experience your trust being used to trap you. It is that pain that creates the stress which damages your nerves. Stress can break you. Read More. For me, this particular kind of broken trust, the kind that causes painful stress, has most recently to do with the judicial system, which I trusted. It has to do with the Constitution, which I believed actively provided Americans with a right to due process in legal proceedings. It has to do with basic right and wrong. It has to do with justice. I’ll tell you what happened because you may be able to use my experience to see how some experience of yours is causing you the painful kind of stress which damages nerves. Line of white spots appeared all at once. July 21, 2008 – The image shows white spots that appeared in a line when a court hearing on Friday the 18th was so stressful it was literally painful ~ The judge, Daniel Sanchez, said I’d done my Request for Hearing wrong. Fine, but that issue wasn’t on the Notice of Hearing I’d received. I hadn’t prepared to talk about it and got confused when Judge Sanchez didn’t focus on what had been noticed. Judge Sanchez had already sent a letter saying that I hadn’t sent him a complete “package.” With his letter he’d sent back the set of papers I’d sent. What made that so stressful was that the hearing had been scheduled on a incomplete package sent in by the Wells Fargo lawyer, so it was obvious that “equal under the law” was not applying. On top of that, Judge Sanchez had, in an earlier case, foreclosed my condo without any hearing after I had answered the Complaint. I didn’t know he’d done it, so I wasn’t able to redeem, even after I borrowed the money to do so. I lost years of work and all the saving I did so that I would not be in poverty in my old age… Judge Sanchez condemned me to poverty I did not deserve. When the stressful realization hit, the pain hit so intensely it made me flinch. I had to hold on to the podium to keep from falling. Anyway, I’ve never before had so many white spots appear at once. Friday night I could not go to sleep. By dawn I was painfully exhausted and luckily I got 3 hours of sleep then. 9/13/09 – It’s taken me a long time to take this picture. 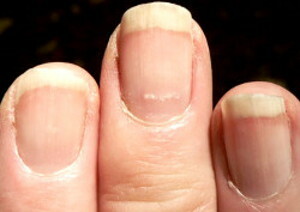 The white marks appeared on May 28, 2009 – They were down at the bottom of my nail, much like the ones in the picture at top. In both cases the white spots appeared in relation to a court hearing in the foreclosure action on my home in which the papers were not served on me, I found the case by accident when I was on the internet. When I complained about not being served the Complaint Judge Sanchez said it didn’t matter that Wells Fargo hadn’t served me since I clearly knew about the case because I was in court. This is a complete denial of due process, one of our most basic Constitutional rights. 9/13/2015 ~ Yesterday I had the rare chance to go out to lunch. Major Treat. My friend Danielle and I went to Raaga, an East Indian restaurant on Agua Fria with superb reviews. A mug of Chai had just been served, I was holding it in my right hand when I mentioned how Wells Fargo lies. The mug fell from my hand and hit the table with a bang. Danielle said something about how I’d “slammed” my mug down on the table. But, I hadn’t slammed my mug down, it had fallen from my hand when I felt the shock of how Wells Fargo lies. I had immediately moved my hand to regrasp the mug, so it wasn’t easy to see what had actually happened. Shortly thereafter our entrees were served. When I looked at my hand and the fork holding a bit of baby eggplant, I saw that the fork and my hand were trembling. Rather than stress my nerves by trying to hold the fork steady, I lowered my hand so that it rested on the table, thus eliminating the visible shaking. When I was thinking about how to explain in an email to Danielle what had happened, I thought of this page. 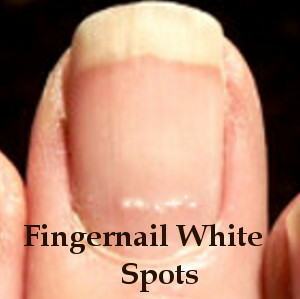 I looked at my nails to see if any white spots had appeared. Indeed, the one shown in the image above had appeared. Now, I wonder whether each time in the past when my legs gave out and I fell, before I had a walker, if a white spot had appeared. What made Judge Sanchez’s words so painful to hear was that my condo was foreclosed without proper service to me, and my home would have been too, but for the complete accident of me finding the case on the internet. My condo was foreclosed by the same judge, Daniel Sanchez, who was now telling me it didn’t matter that the bank hadn’t served me foreclosure papers on my house. That very same judge had signed the foreclosure judgment written by the Deutsche Bank lawyer in the foreclosure of my condo without making any changes, probably without reading it. The foreclosure judgment Judge Sanchez “robo” signed said I had not answered, but in fact I had. I wasn’t served the judgment nor the notice of auction, so I couldn’t redeem my condo because at that time in New Mexico you had to be the first to file to redeem and I couldn’t be first if I wasn’t even aware it was happening. I paid $7,000 in interest to borrow the money to redeem, and the courts wouldn’t let me. The fact I didn’t have due process was skimmed over like Clarence Thomas ignoring a complaint against Monsanto. What made this so extremely stressful is that my Constitutional right to “due process”, the proper notice enabling Americans to participate in the judicial process, was denied to me. When due process is denied the proceedings are supposed to be void, but in New Mexico at that time the foreclosure which should have been void, was allowed, and when I complained at later hearings the new judge, Michael Vigil, allowed a man to redeem for far less than I had gotten a cashier’s check to use to redeem… Whether it’s true or not I don’t know, but on a news forum sometime after that I was told that Judge Vigil was seen partying with the gay man he’d allowed to redeem when he denied me my right to redeem. Usually the amount of vitamin B12 I take is sufficient to keep me from feeling suicidal. Feeling suicidal is often a symptom of low vitamin B12. Read More. I felt as if I was going to die on the sidewalk in a short time if I were foreclosed because I have so little money each month. But then a woman from the City called and it looks as if there’s low income housing, so I wouldn’t actually be living on the cement sidewalk, and I began to get better. Since then I’ve seen that the Deutsche lawyer who wrote the papers in my condo case lied in a lot of them. I have an Adversary Proceeding in bankruptcy court regarding the lawyer’s violations of stay, so I’ve looked at everything he filed and it’s possible he completely misled the judge. I am hoping that the judge looks at the fact that I tried to pay my mortgage to Wells Fargo off in 2005, but Wells Fargo wanted to auction my home rather than letting me pay it off, so I filed Chapter11 and saved my home, but destroyed my credit so I couldn’t refinance before the mortgage meltdown. I hope that the judge looks honestly atmy counterclaim against Wells Fargo for bad faith. 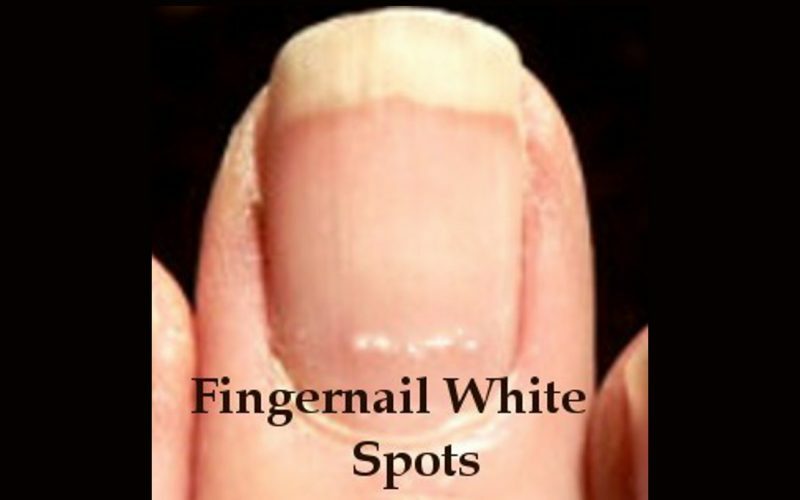 The first time I noticed white spots on fingernails they were on the nails of a young woman at a party with her boss, the very good looking, head solicitor for the Borough of Islington, in London. I knew him because he’d come to my flat to encourage me to leave. He wanted more parking for the Borough, for which he needed a bit of land from the Worshipful Company of Brewers ~ they owned the building in which my young son and I were living. In exchange for the land, he would give the go ahead to the Worshipful Company to tear down the building where my son and I lived. The Brewers wanted to develop the land, you see. However, there was a law in London that people who rented an unfurnished flat had a right to tenancy for life. So, there my son and I were. In any case, the man was one of those extremely good looking men, the kind who make you think about their looks before anything else. The young woman was not exceptionally beautiful. I remember that she said she played the oboe. I was impressed. She seemed interesting and understated. But, there were the spots on her fingernails which made me wonder if she felt insecure, though she came across as anything but. June 20, 2013 ~ The bankruptcy court ruled in favor of the lawyer. The judge, Robert Jacobvitz, talked glowingly about how lawyers are energetic for their clients… that’s how he viewed the lying in court. Judge Jacobvitz acted as if his daughter was married to the lawyer’s son, or vice versa. Perhaps it’s simply that he himself is married to other lawyers, like himself. The man I hired to drive me to the hearings said the judge was Too Friendly. Meaning it wasn’t sincere. And indeed I felt that, too. This is from the very beginning. It was like Judge Jacobvitz knew he was ruling against me so he wanted to act as if he was fair. I appealed, but Judge Jacobvitz was affirmed. The fraternity of lawyers has a lot of far reaching power. Violation of the Automatic Stay is supposed to carry mandatory damages. But, I guess when you have a judge who likes a lawyer and doesn’t like self represented parties, the law is bent as the judge likes. In any case, I threw away all the legal books I’d collected over the years, and all the legal papers. I didn’t read the 10th Circuit’s opinion because state court judge Michael Vigil, who confirmed the sale of my condo, had said, “There’s no way she’ll get that condo back” when he was asked about it by the broker of the real estate agent who bought my condo at auction. The auction I hadn’t been told about. The important thing… NOW… is how great my former legal-papers room is looking as I transform it with the goal in mind of clearing the legal stress away with the papers. You can see the HUGE difference: Transformation. One kind of stress is beneficial because we can succeed in the face of obstacles. 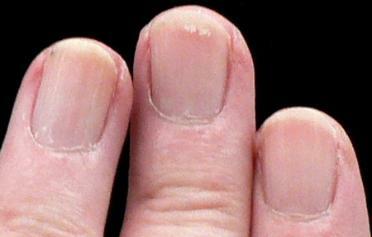 Another kind damages our nerves and causes white spots on our fingernails.